“For the year we achieved record revenue, and profit as well, demonstrating we continue to effectively execute our strategy,” Vince McMahon, WWE’s Chairman and CEO, said on his company’s fourth quarter earnings conference call Thursday morning. “In other words, we know what we’re doing,” he quipped. The report also provided results for the full year of 2018. 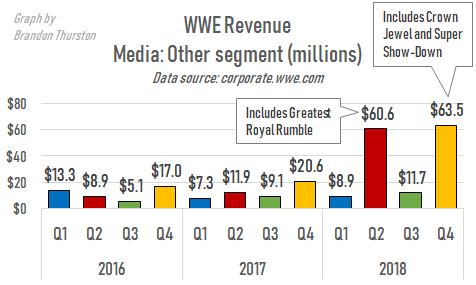 Thanks largely to increased TV rights fees and a lucrative deal to provide events for the Saudi Arabian government, WWE took in more money than ever and reported higher net income than ever. TV viewership and event attendance are down. The company’s popularity is in question. 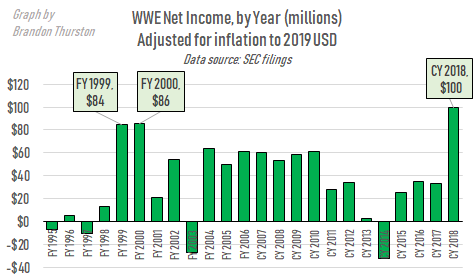 Finances, however, even when adjusting for inflation, are the highest in company history, even higher than the lauded Attitude Era of the late 1990s when popularity was likely at its peak. With a new round of U.S. TV deals beginning at the end of the year, the company projects it will report over $1 billion in revenue, another record. 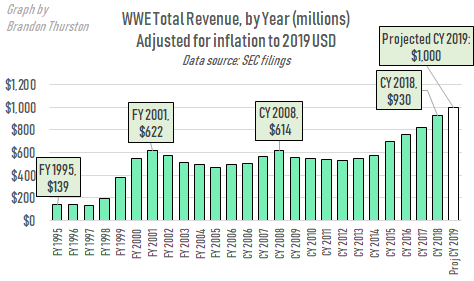 For profitability, WWE projects it will make at least $200 million in adjusted OIBDA (the company’s favorite profit metric), more than the record $178.9 million reported for full year 2018. How much money did WWE make for Crown Jewel in Saudi Arabia? It’s likely WWE was paid somewhere between $40 million and $50 million by the Saudi Arabian government for the Greatest Royal Rumble in April. It’s harder to figure out what WWE was paid for the second of a 10-year deal with the government, Crown Jewel on November 2 in Riyadh. The event went forward despite public and political pressure following the murder of journalist and Saudi dissident Jamal Khashoggi. Payments for Crown Jewel are reported in the “Other” segment within the company’s Media division. It’s lumped in along with revenue from WWE Studios and reality TV programming like Total Divas, Total Bellas and Miz and Mrs. To make a guess more difficult this time, revenue from the Super Show-Down event from Australia on October 6 is recorded in this segment also. Without knowing more details, which WWE doesn’t divulge, it’s hard to say what the price of Crown Jewel was. Given the likely high price of the Greatest Royal Rumble, at least $10 million for Crown Jewel seems like a conservative estimate. There were no questions on the conference call about whether WWE has given any consideration to whether it will continue with its relationship with the Saudi government in light of the regime’s ongoing human rights abuses, including its admission government agents were involved in the killing of Khashoggi. “Bringing Ronda [Rousey] in gave us more visibility, in terms of the initiative of reaching more women,” McMahon said in response to a question on the call about whether losing Rousey would hurt WWE’s brand. It was recently reported Rousey may be finishing up with the company after Wrestlemania this year. McMahon’s comment about Rousey helping WWE reach more women isn’t supported by viewership data for Raw and Smackdown, which shows female viewership declined in 2018 more rapidly than male viewership. As long as WWE knows when stars like Rousey will be leaving, it remains beneficial to the company. McMahon continued, getting into some detail rare for him on an earning conference call. He went on to talk about star power, injuries and their effect on recent declines in viewership in attendance, the latter also evident from metrics reported in the earnings release. The unfortunate aspect sometimes in our business is that we -- our performers are not cartoons. They get hurt. And this year, leading up to where we are now, we’ve had a number of injuries. And when you have injuries, again, there’s a whole bunch of them, Roman Reigns being principal among them. And even John Cena -- not an injury type thing -- but we thought we’re going to have John more of a part of our programming than we do. Ya know, John, God bless him, is making more movies. And even John I think would say, ‘Geez, I thought I was gonna spend more time with what I love to do, which is WWE.’ So he’s been coming in and out. So he’s not really a part of our storyline. You lose John, you lose Roman Reigns, in addition to that we’ve had injuries: Sasha Banks; Becky Lynch, who is one of our top female performers, was injured; Kevin Owens; Sami Zayn, Bray Wyatt; Charlotte Flair; Alexa Bliss; Braun Strowman; Dean Ambrose; Ember Moon; Samoa Joe; Akam, from a new tag team [the Authors of Pain]; Jason Jordan; Fandango; Big Show; Seth Rollins. We’ve had all these injuries which is really unusual for us. And they’re characters. It’s different than if you were writing a soap opera and all of the sudden your main character wasn’t there. You’re in the middle of production. What do you do? Well, you very nimbly change the storyline. But it’s not as good as the original one. Sometimes it’s better, because we’re pretty good at it. But those are the things that we’re faced with. And one of the reasons why television ratings have dropped, and one of the reasons obviously from a live event standpoint, that’s dropped too, because you don’t have your favorites on television, obviously you can’t see them at a live event either. McMahon indicated when those absent performers return he’d expect to see attendance increase. 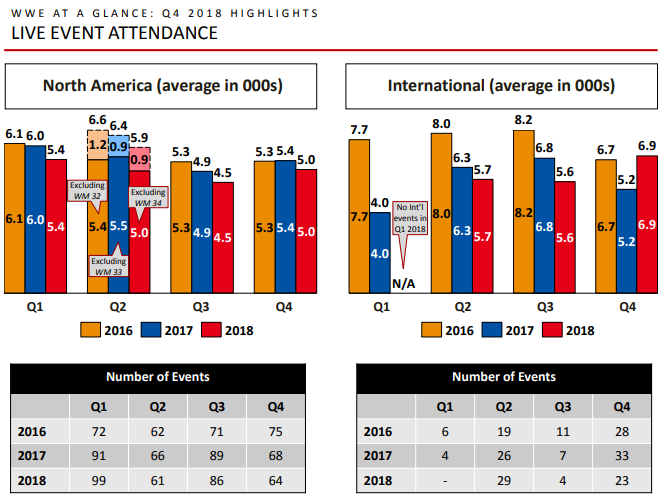 Average attendance in North America, where WWE does the majority of its ticketing business, declined in quarterly comparisons for the fourth straight quarter, completing a full year of declines and continuing a consistent downward trend that’s been ongoing since at least 2016. In a rare volunteering of detail, WWE Co-President George Barrios defended the attendance decline during the conference call. He cited data from a slide in the investor presentation. While average attendance is trending down, total attendance over the last eight years is trending up. Total attendance in 2018 is at 1.5 million attendees, higher than 1.3 million in 2011. This is driven largely by an increase in ticket prices, also driving an increase in ticket revenue in North America over the same set of years. Barrios pointed out that attendance at televised events is growing or stable. 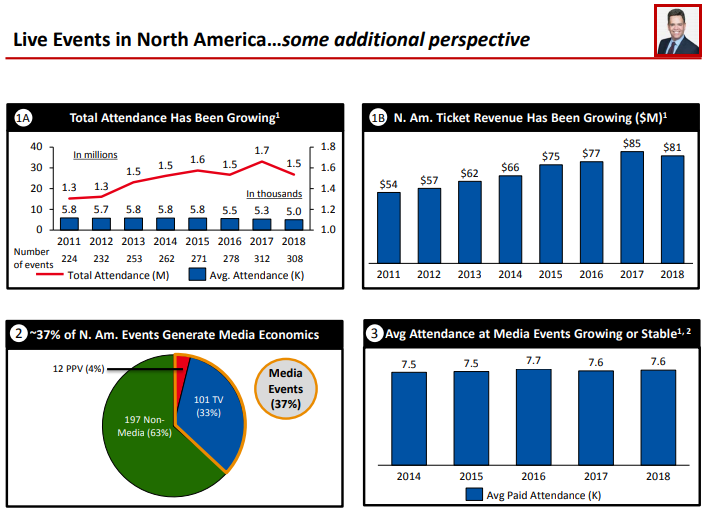 TV events like Raw, Smackdown and pay-per-views averaged between 7500 and 7700 in paid attendance between 2014 and 2018. This implies non-televised events, often called “house shows”, which makeup 63% of all main roster events are the culprit in the decline. Barrios didn’t get into detail about why house show attendance might be suffering, or what the company will be doing to address the problem. McMahon commented during the Q3 conference call in October that WWE’s live events business would soon be “re-imagined”. 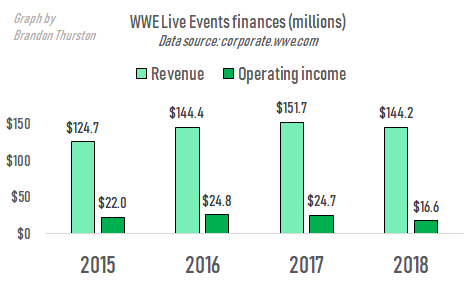 Revenue and more significantly, operating income, for the Live Events division were down in 2018. Revenue for events was about where it was in 2016, however operating income was at its lowest point in at least the last four years. 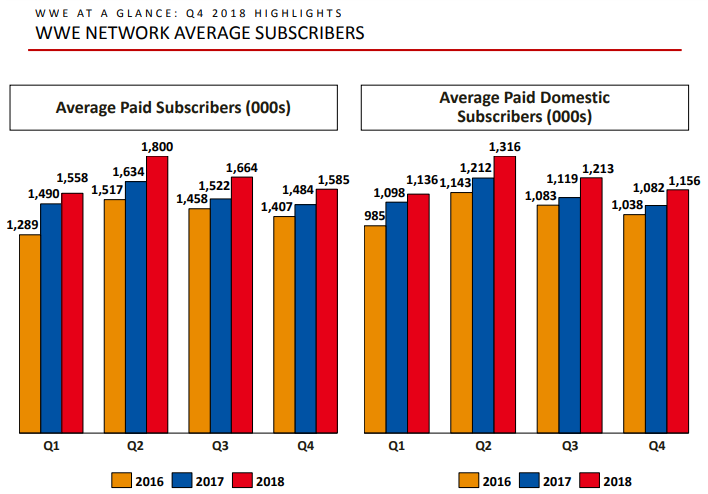 Average paid subscribers in Q4 for the WWE Network were 1,585,000. That’s slightly higher than the projected 1,560,000. 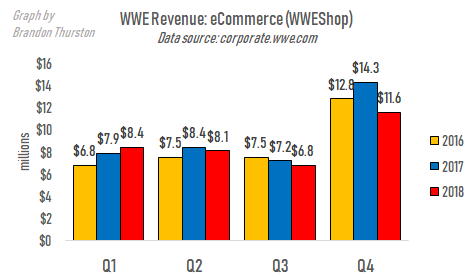 The subscription streaming service that airs all of the company’s pay-per-view events as well as NXT has been growing its subscribers in quarterly comparisons since the launch of the service in 2014. WWE projects Q1 will be up slightly from the prior year quarter, at 1,590,000 subscribers. That that number is almost identical to Q4’s, it may be a signal that Network subscriber growth is finally slowing. The Network’s slowing growth is contrasted by Barrios’ announcement during the conference call that “given the success of the WWE Network” the company would no longer be giving an update on subscribership on the day following Wrestlemania, when numbers are at their peak. A new premium tier for the Network may be on its way. The earnings press release noted key investment areas in 2019 would include, “developing the next iteration of the WWE Network service”. Merchandise sales at live event venues is down over the last few years. This is not entirely due to a decrease in attendance. Venue merchandise sold per paid attendee for 2018 was about $11.00, down from 2016’s $11.51. 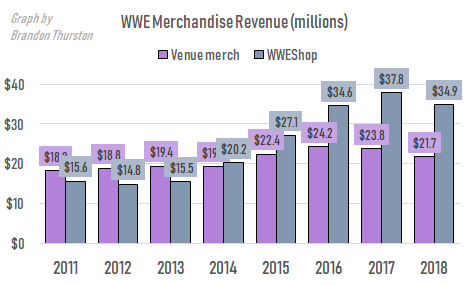 Over the last several years, WWEShop has grown stronger than venue sales. Yet Q4, which includes the holiday season, was down to $11.6 million for eCommerce, a drop from $14.3 million in 2017 and $12.8 million in 2016. One of the first questions executives were asked when the call was opened was when news should be expected to be announced on a new TV deal in the U.K. WWE previously gave guidance that a new deal would be announced by the end of 2018, but the year ended without so much as a rumor of a deal being finalized. Barrios suggested a new U.K. deal should be expected “by the middle of the year”, also the timing the company continues to expect to finish a deal with a TV partner in India. Rights to Raw and Smackdown in the U.K. are currently held by Sky. Rights in India are held by Sony. Both deals expire at the end of 2019. Formerly only touring small shows in Florida, NXT in 2018 completed its third full year running events around the U.S. and the rest of the world. During that time the brand generated a few million dollars per year in ticket revenue. NXT runs somewhere in the range of 183 and 189 events each year, generating between $6 million and $7 million in tickets. Average attendance was down in 2017 and 2018 (about 800) from 2016 (about 1000). Average ticket prices have gone up over that time, with average price rising from $37 in 2016, to $44 in 2018. Less than $10 million per year though surely doesn’t cover the annual cost of maintaining overhead, staff and other costs at WWE’s Orlando training facility, the Performance Center, nor the cost of talent working for the NXT brand and training at the Performance Center. In other words, NXT doesn’t stand on its own as profitable. It’s benefit to WWE must be justified as developmental for the company overall. Brandon has been writing about the wrestling business since 2015. He’s an independent pro wrestler, wrestling trainer, and co-host of the podcast Wrestlenomics Radio.